SEOUL -- From a German city, Doosan Infracore, a South Korean construction machinery manufacturer, has overcome the 8,500-kilometer distance to remotely control an autonomous construction machine using a 5G network at a simulated construction site in the western port city of Incheon. The remote control of an unmanned excavator was demonstrated first during at a trade fair in Shanghai in November last year. 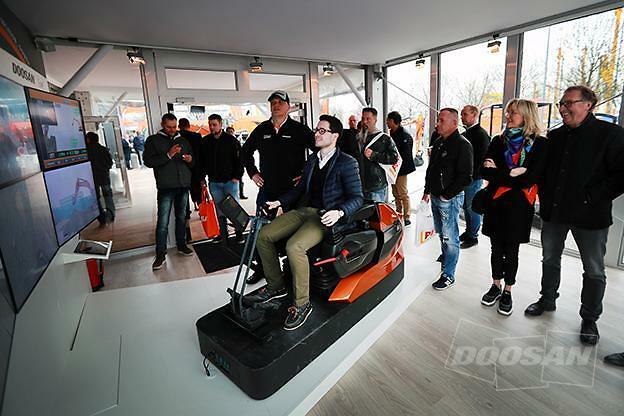 It was showcased again from a control center at the Bauma 2019 fair this week in Munich, Doosan Infracore said in a statement on Tuesday, adding the latest demonstration proved its technological prowess in remotely controlling construction machines anywhere in the world. "Visitors were interested in innovative construction machine solutions that utilize South Korea's telecom technology that commercialized the world's first 5G service," a Doosan official was quoted as saying. "We are going to increase our status as a technology leader in construction machinery by upgrading automation and unmanned technologies, including high-tech ICT convergence." Doosan Infracore, a key Doosan group unit, has teamed up with LGU+, the third-largest mobile carrier, to develop self-driving construction machines using a 5G communication network, drones, and ultra-low latency video transmission technology. Autonomous machines would transmit the 3D image of construction sites photographed by a drone to the server in real time and automatically calculates the workload. On display at the German fair were small wheel loader products that can be controlled remotely as well as "Zero-tail Swing" excavators that work in a narrow working environment in downtown Europe, Doosan said. Doosan vowed to step up the commercialization of its teleoperation technology using a 5G network and "DoosanConNECTTM," a telematics service that remotely monitors construction machines based on information and communication technology, as well as a 3D machine guidance system that could be combined with AI technologies to develop self-driving excavators. The machine guidance system, showcased by Doosan in September last year, uses sensors, a controller and GNSS to monitor the real-time status of excavators. GNSS refers to a satellite navigation system that provides autonomous geo-spatial positioning and allows small receivers to determine their location to high precision using time signals transmitted along a line of sight by radio from satellites. With rapid advances in sensor and computer technologies, there has been growing demands for autonomous equipment at warehouses, distribution centers and construction sites. 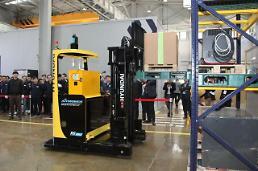 Unmanned forklifts developed by Hyundai Construction Equipment (HEC) will hit the market this month. A control system using a laser recognizes the surrounding environment and obstacles. HEC has teamed up with Trimble, an American software company, and SK Telecom to develop a 5G "smart construction" platform by using big data and artificial intelligence that would enable autonomous operation and remote control of construction equipment to improve efficiency and reduce dangers at construction sites.